If you favorite, love, follow me, remixed, comments, replied, or invited me, I'll follow you. 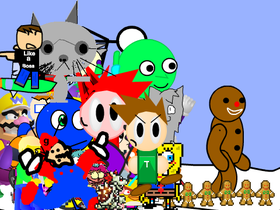 Add Yourself Chasing or running The Gingerbread Man! how mutch projects can we get? Remix the project The art contest to be a manager! Lets get over 100 Managers and proj. by July 11th!!! Awesome studio! Nerdy Geeks studio! Trump, please don't build that wall!